It’s a well known joke among indie rock fans that there are tons and tons of “wolf” bands. Everyone from Wolf Parade to Aids Wolf to Guitar Wolf. There’s something about the lupine animal that just attracts musicians trying to come up with a band name. With the success of wolf bands the backlash is going to be inevitable. Which makes Torontoist wonder which animal will be de rigeur for struggling indie musicians everywhere. We think this weekend’s Over the Top Festival might hold some clues. On opening night we have a bear band, Brooklyn’s Grizzly Bear who’ll be playing with Gentleman Reg at the Music Gallery. The show tonight at Sneaky Dee’s has both big cats (Japanther) and big African game (Video Hippos). Other non-animal musical highlights from the fest includes a Pop Montreal showcase tomorow night and Alberta’s Chad Van Gaalen, on Saturday. There’s also a Sunday evening show at the Drake with Ottawa’s the Acorn and Eye cover makers Sailboats are White. 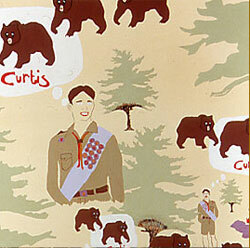 Illustration from the Grizzly Bear site.